Nothing can beat fresh homemade Basil Pesto, but this Kirkland Basil Pesto from Costco is pretty great. Click to PIN Kirkland Basil Pesto and 20 Recipes Using Pesto! If you’re a regular reader of this blog, you know that I love to make my own basil pesto in the summer when fresh basil is abundant, and I think my recipe for Basil Pesto with Lemon can’t be beat. But sometimes fresh basil isn’t available, and I love recipes with pesto even in the dead of winter. For times like that, I’m a huge fan of this Kirkland Basil Pesto from Costco, a great product that I’ve been buying for years. Unlike tiny jars of pesto that you see in the grocery store, Kirkland Basil Pesto comes in a big 22 ounce jar, enough pesto to make any recipe that uses basil pesto. And this pesto keeps a long, long time in the fridge (and like my basil pesto with lemon, it can be frozen.) And just in case you’re wondering, Costco has never given me any pesto or paid me to write about it here, but I’m excited to add it to my list of Kalyn’s Kitchen Picks! Easy Baked Pesto Chicken is one of the most popular recipes on the blog. Barely Cooked Asaragus with Basil Pesto is also easy and delicious! This amazing Foil-Baked Salmon with Basil Pesto and Tomatoes is something I make all year long. Baked White Fish with Pine Nut, Parmesan, and Basil Pesto Crust is also great for a special meal. Twice-Baked Spaghetti Squash with Pesto and Parmesan is fantastic pesto recipe for a meatless dish or side dish. Easy Pesto Lemon Rice is also quick and delicious for a side dish. 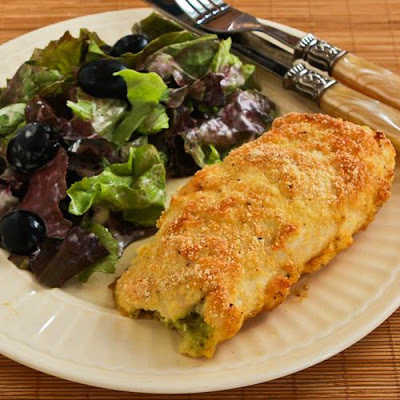 Baked Chicken Stuffed with Pesto and Cheese is another combination with pesto and chicken that’s been hugely popular. Turkey Pesto Meatloaf with Tomato Sauce is another favorite of mine. 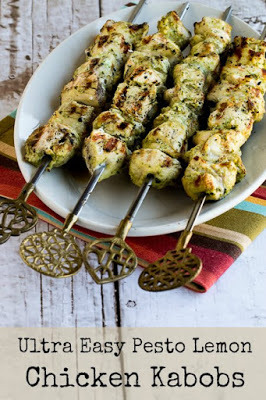 Ultra Easy Pesto Lemon Chicken Kabobs can be cooked on a stove-top grill pan when it’s not grilling weather. Foil-Wrapped Grilled Tilapia Packets with Pesto, Tomatoes, and Green Onions could also be cooked on a grill pan. (If you have a favorite way to use pesto, please share the idea in a comment, or leave your recipe link if you’re a blogger). 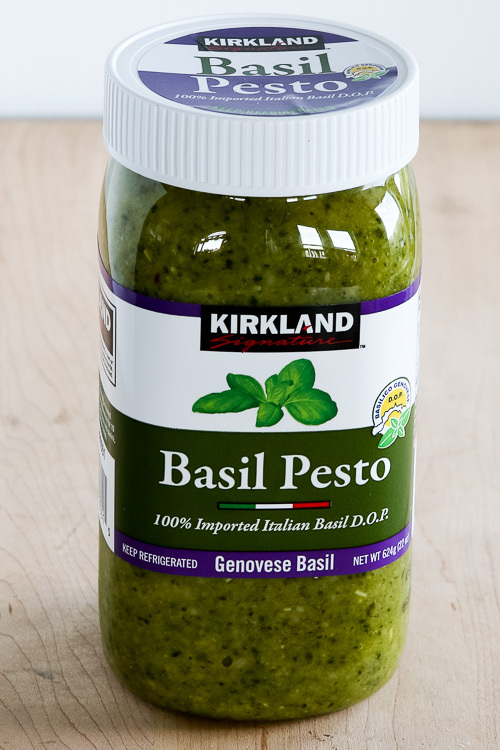 I purchased the Kirkland Basil Pesto shown here myself and Costco has no idea whatsoever that I’m writing about their product. All items featured as Kalyn’s Kitchen Picks are things I happily buy over and over, and so readers will know that my opinions are completely unbiased, I don’t accept review products from the many companies who offer to send them to me. You can see the complete list of products I’ve chosen to feature at Kalyn’s Kitchen Picks. I make pesto cheesey bread. I buy a French bread and score it, then fill the openings with melted butter, parmesan and asiago cheese (or any other mixture), and pesto. Wrap in tin foil and bake for 20 minutes. Yum! That has to be delicious! Not sure, it does contain cheese but it’s Parmesan cheese so I’d guess the shelf life is pretty long. I would refrigerate a few hours, then open and taste to see if it still tastes okay. If it does, I bet it’s fine. But I haven’t ever done this so I can’t say for sure. Maybe check Google to see if it’s mentioned there. One thing you could do is freeze in ice cube trays, which would kill any bacteria. Then thaw a few cubes when you need to use some. Hi there, my husband picked up a jar of this at Costco and put in the cupboard. I see now that it says keep refrigerated. Do I need to throw it out? I don’t really know the answer. It has cheese , but if it was only in the cupboard for a day or two it might be okay. Sorry, I don’t feel qualified to give a more definite answer than that. I usually buy Trader Joe's (Trader Giotto's Pesto alla Genovese) jarred pesto and just love it. I'll have to try the Costco jarred pesto. How long (approximately) is a "very long time" in the refrigerator? Tracey it has a "use by" date on the jar. I haven't ever noticed exactly how long it stays good, but a few months at least. I totally agree with you here, Kalyn, we always have this pesto in the house, not only is it delicious but a great price! Yep, I have a jar of this in my pantry at all times (except summer). Thanks for including one of my recipes; I love pesto year-round, and this pesto is a great value and great flavor. Agree Lydia; I think this is the best store-bought pesto I've had and especially for the price!